::: Off the Radar :::: The Raveonettes Return! Woke up this morning to a sparkling fresh new gem and news from The Raveonettes! Sweet!!! Seems they are going to be releasing new album 'In and Out of Control' October 5th in the UK through Fierce Panda Records. 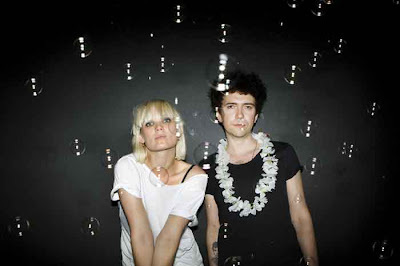 I adore The Raveonettes! Been a fan for years. Seen them perform a few times and they are always amazing live! They are like a transplanted classic rock band who went through a time portal from the past to rock our time! That's how I'd best describe them. Keeping the spirit of rock n' roll alive and well! Thanks for that! This new track they sent us 'Suicide' is classic Raveonettes and I LOVE it! Why mess with a good formula? Didn't realize how much I missed their sound and their beautiful voices. Here's a video of them performing 'Suicide' at a club during the Lollapalooza Festival a few weeks ago in Chicago. P.S. How much do they look like Sid and Nancy in their new press pic!? !